This machine is the most scarcity tape recorder of the collection. Probably, there is no one other machine in Europe, like this. Made in Australia, (!) in 1955. Portable studio-machine. Tape speed is 38,1 cm/s. In the relatively little box can be found the mechanics and the amplifier with double vacuum tubes. 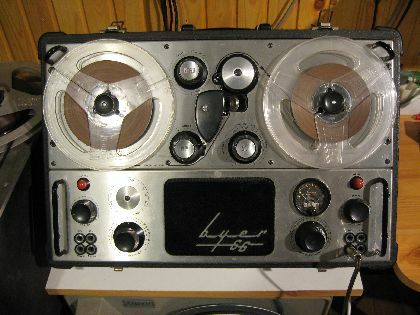 Distortion from tape: maximum 1%. Mr. Robert L. Atchison, the chairman of the Ampex Co., USA, visited the Museum in 2006, and he sent this machine as an admit.